My fascination with barley continues. I have another recipe and this time it's a salad! I tried it and like it very much. If I were to choose my favorite recipe of the 3 I have shared so far, I would definitely choose this one. It is the easiest, has less mess and tastes fantastic! 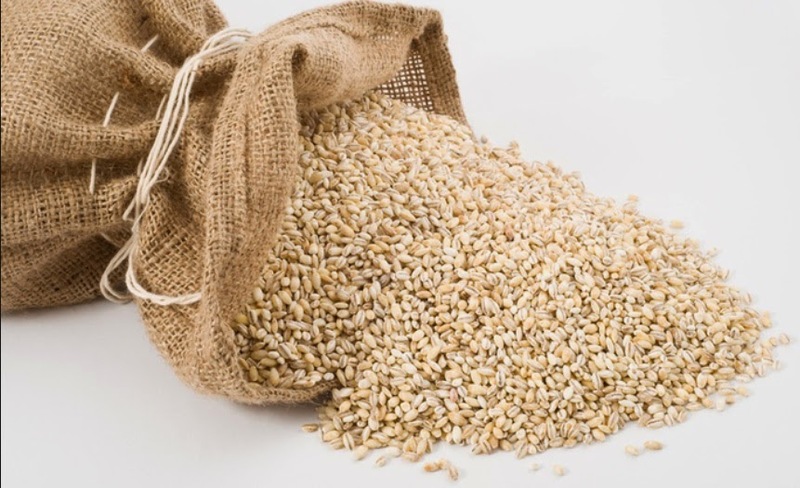 I realize that barley is considered one of the gluten grains and if you are gluten sensitive at all, you may be thinking you want to try and avoid barley and all its glorious nutritional goodness. First of all, I am one of those gluten sensitive people. Yep, had myself tested and the Doc says I have some definite gluten sensitivity. He couldn't really tell where on the spectrum I was. From what I can tell, it's a sluggishness in my whole metabolism after eating white flour and wheat products. Gluten Sensitivity is quite a range, to say the least. There is the full-blown Celiac Disease, where any kind of gluten can wreak havoc on your system, damaging tissue and organs, all the way to just the slightest irritation in the system when too much gluten is consumed. Because of its immense nutritional value it becomes a question of whether or not the benefits of eating barley outweigh the risks. For me, I say yes! Barley is such a good source of dietary fiber and selenium! What does that mean for you? It means, for one thing, that chances are good you can avoid colon cancer because the fiber going through your colon can sweep out the cancer-causing cells in the colon, plus selenium is shown to reduce the risk of colon cancer significantly! That is huge for me because one of our best family friends died an early death because of colon cancer. He was running marathons one day and dead a few months later. He also had two older children who died even sooner than he did from colon cancer and brain cancer. I think I'll keep eating barley! Here's the recipe! I served it at a family get-together and it was gone in no time! Everyone loved it! In a medium saucepan bring the barley and chicken broth to a boil. Cover and simmer over low heat until done, about 40 - 50 minutes. In a large skillet, heat oil and saute both the frozen corn and onion along with the salt, pepper, and garlic powder until transparent, about 8 minutes. Mix 1 1/2 cups of the barley with the corn mixture together in a medium salad bowl. Toss in the tomatoes, the mint and the chives/green onion. Serve warm or cold. It is wonderful! Adapted from Solid Gold Eats, a great food blog! Is there a better kind of barley? I think one of the most daunting things for me whenever I've tried a barley recipe is that there are always so many different kinds. I don't know if using one over the other will mess up my recipe or not. This salad looks delicious though - maybe I'll finally get over my fear and give this one a shot! Sounds delicious! 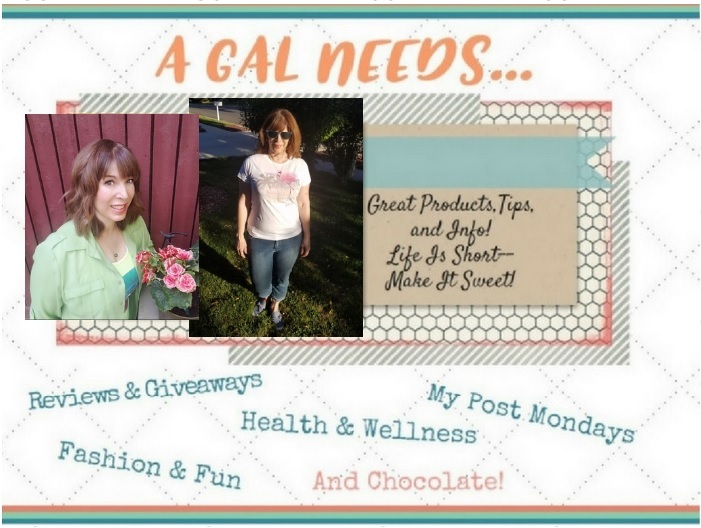 I'm for anything made with garlic, its one of the most healthful ingredients and any recipe. Alicia, go with the hulled barley or the pearl barley. Hulled barley is less refined and takes slightly longer to cook, but more nutritious. Pearl barley is more refined and takes a shorter time to cook, but is still nutritious! The corn and barley salad looks very appetizing. I have never tried this. So perhaps tonight for supper I will. I found this through Friday Favorites and I have been craving a good salad today-this looks delicious! I love barley. I love making it with mushrooms. 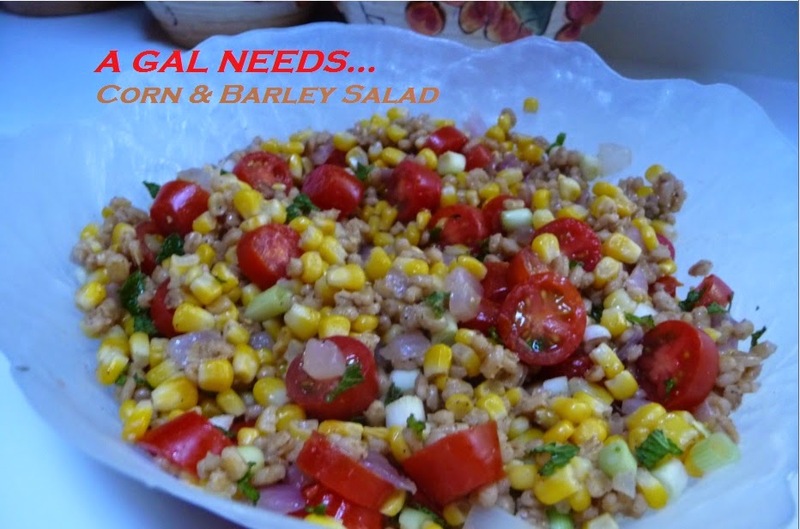 I really like this delicious and healthy Corn and Barley salad. I never thought about making this salad, and I like the taste of barley and I will try this recipe. Thanks for sharing. I have to avoid the gluten so can't use barley. I tried to sub buckwheat but don't do too well with any grains in general, not even oats. Oh wow! This looks amazing! I have to try it!